Butternut squash and sweet potato soup is creamy without adding any cream! A great way to get a creamy texture is to puree the soup! A super healthy, low-fat, low-carb and delicious soup! An easy and quick choice for any weeknight meal! Perfect for any Holiday meal too! 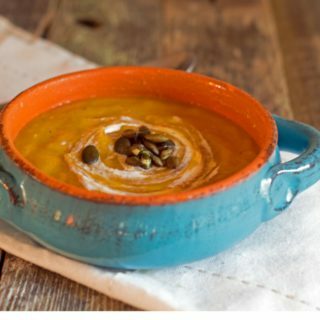 My recipe for this butternut squash and sweet potato soup is super creamy! Yet, there is no cream! This soup is low-calorie, low-fat, and tasty! I first published this recipe last year and I have updated the recipe and added new photos. The addition of cinnamon which really adds lovely flavor! Delicious, low-calorie and nutritious! everyone is happy! This soup is really hearty and fills me up! Butternut squash and sweet potatoes are so great for your health! Both are loaded with potassium which helps to keep blood pressure in check! They are loaded with vitamin A which is great for our eyesight! Both also contain vitamin C which helps our immune system! So go ahead and make this tasty soup! Your body will thank you! I love Autumn and soup I can eat year round! This one is a family favorite and I hope you make it and enjoy as much as we do! I pair this with my Roasted Seasoned Winter Squash Seeds! Nothing gets wasted in the butternut squash! The seeds are seasoned with Homemade Seasoning Salt, which works great on any squash seeds! Add a little low-fat sour cream as a garnish, and enjoy! I hope you like this recipe, and if so, please share the love on Facebook, Pinterest, or your favorite way of relating to your friends and family, and please continue connecting with me on Instagram, Twitter, Bloglovin, Google Plus ! Follow me on Pinterest so you can pin all my favorite recipes! Butternut squash and sweet potato soup is super creamy without any cream! A fantastic and nutritious meal for any night and perfect for any Holiday meal! Heat a Dutch over medium heat, Add in onions and saute for about 2 minutes, onions will be translucent. Add in garlic and stir for about another minute. To the pot, add cubed butternut squash, sweet potatoes, vegetable stock, cinnamon, ground black pepper, and salt. Simmer for about 45 minutes. Squash and potatoes should be fork tender. Use an emulsion blender to puree the soup. Can use a blender also. NOTE: if using a blender, puree soup in batches. Be careful, as the soup is hot. Use a towel to hold over cover while blending the soup. Soup is ready to serve. Can be kept in the fridge for about 4 days. This was just wonderful. I loved the flavor of this soup. Excellent Arlene. I am happy you enjoyed the soup. It is a good one. 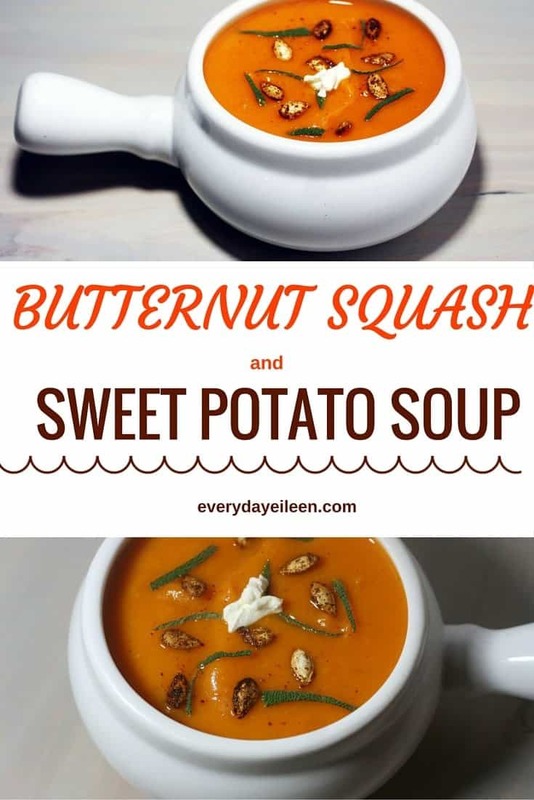 This soup looks amazing but I don’t know how much butter squash to use or how many sweet potatoes to use. Can you please let me know? Hi Lisa, I have recently changed how my recipes are published and I am still reviewing the corrections. Thank you for letting me know about the ingredients in the soup not showing correctly. I have corrected the amounts. I use a large butternut squash. Usually its around 4.5 – 5 pounds. The sweet potatoes I use 2 large sweet potatoes. I don’t normally weigh them. I hope that helps. I hope you let me know how the soup is after you make it. I love butternut squash! What a superb soup! Thank you for sharing this recipe, pinning now to my Soup board, thank you! Thank you Sara! I am so glad you like the recipe and thank you so much for the pin xo! Yummy! I’m sure my husband and kids would love it, I would love to try it. The perfect flavor combos for this time of year. It’s a great looking soup too! Butternut squash soup is my favorite. I will have to try your recipe. I like making mine with curry! 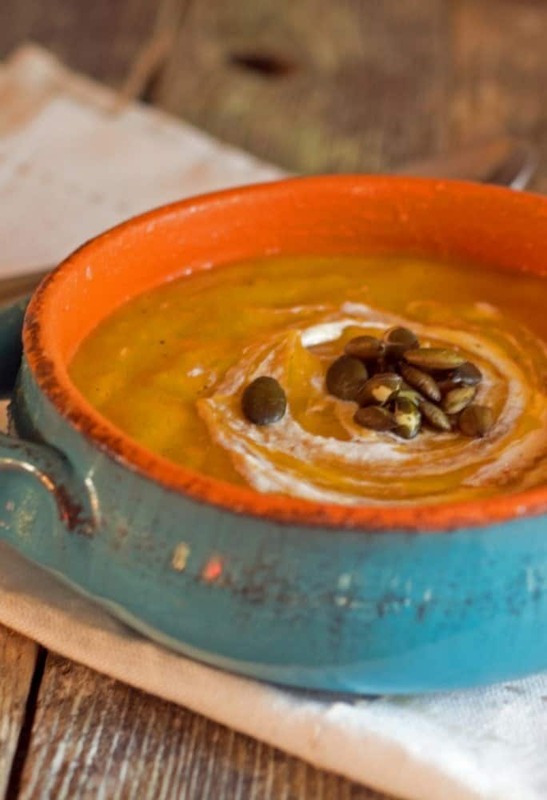 Butternut squash and sweet potato in a soup sounds awesome! This is going to be my new comfort food. I would probably throw in croutons or serve this with breadsticks. Yum! I am so glad you like this soup! Soup or breadsticks would be great too! Or even a garlic knot! Omg this soup sounds so yummy! I never had sweet potato in a soup. Must give this a try! Please do, it will be a warming comfort for the winter months! This dish looks so comforting! It’s one of those soups that is best served on a cold night. thank you so much Nagi! such an honor to have you like my recipe! This looks yum. I love a creamy soup during the colder months. This looks like the perfect winter soup! We are BIG soup lovers- My toddler’s favorite dinner is soup (because she gets to dip bread, of course!). My kids always ate soup when they were little! They grew up to eat very well balanced meals with lots of veggies! What a yummy soup and this is the season for a warm and comforting soup. We tend to enjoy soups much more in the winter (as most people I think do) and I’m always looking for new recipes. I hope you make this for your family Brandy, and they enjoy it as much as my family! OMG! these really looks yummy. My family would love this soup too for sure. Thanks for sharing your delicious recipe. Thank you Onica! I hope you make this for your family! I hope your Fiance makes you a nice pot of this soup! YUM YUM! I do a carrot & sweet potato soup that is similar. I love think soups this time of year! I also ove a carrot and sweet potato combo, so delicious! I love soup, I must try this recipe. This looks delicious ,Eileen. Fantastic Rika, I hope your guests enjoy! Lt me know how it works for you! This a great Fall and Winter dinner option for chilly weather, plus it’s hearty enough to be satisfying. Thank you Karen, I hope you like the soup! Yummy! The combination of butternut squash and sweet potato sounds great. I can imagine this soup has a hint of sweetness. Thank you it does have a really nice balance of sweet with a kick from ginger! I love that you added some ginger to this. That would give it just the right kick! Thank you Liz, any chance to add ginger, I jump on it! I don’t blame you. It’s such a wonderful spice to work with! I have never had any of these in soup form so this might be a good way to start. Looks tasty. This is so tasty and healthy, I really hope you give it a try! I love a good butternut squash soup, in fact, I have a curried version in my fridge right now. I’ll have to try this soon! Curry is a wonderful addition to any soup! Yum! Yum! Butternut squash and sweet potatoes are two of my favorite fall flavors! That is great Mardene! Hope you make this one, I love it! Now this soup I can sincerely say I know I would love. Squash has always been a favorite of mine and of course sweet potato-who doesn’t love them? Combine those two and you have a basis for a delicious meal. Thank you Michele, this is a family favorite in my house! Easy, tasty and healthy! That sounds like a perfect soup for a cold winter night. Can’t wait to try it. Great, please let me know how you liked the soup! 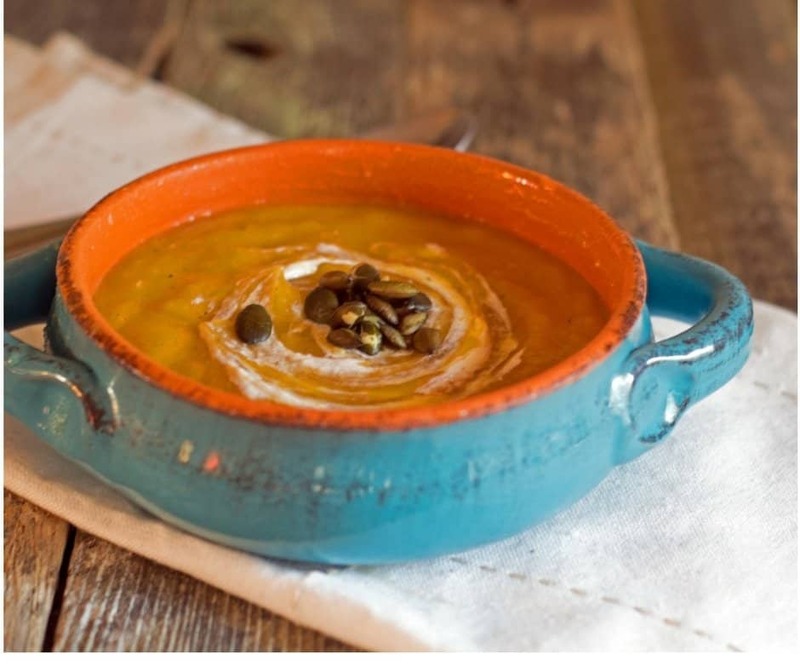 Butternut squash and sweet potato soup is my favourite I love orange soups. Putting ginger in is great for the digestive system. I love a creamy and hearty soup like this. I can’t wait to try your recipe. Butternut squash is already so awesome on its own what more if you add sweet potato to the mix! I love the combination and I think it tastes just as good as it looks! Thank you Elizabeth, it really is a tasty soup, and has a little kick from ginger too! This is my favorite kind of soup. I need to make this. I hope you make it and enjoy!, Tara, we love it! That soup looks so good! I want to try this recipe! I can’t get over your soup dish! I love the handle on it! Where did you get it!? Thank you Heather! I believe I got a bunch of these at Marshalls! I know I love the bowl.. Got in a rust color as well, which is great for light color soups! Looks awesome, Butternut squash and sweet pototoes best time to have on cold night. Something about soup …I can imagine how your soup taste. Love your graphic. Thank you so very much Patrice! This is really yummy!